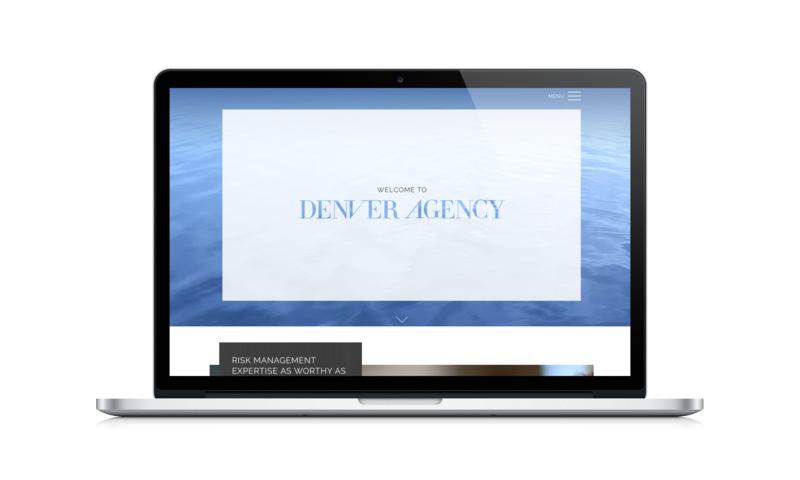 Denver Agency is an 80-year-old independent insurance agency located in, wait for it, Denver, Colorado. The firm specializes in developing risk management program for high net worth individuals and families. The one percent of the one percent if you please. A longtime fan of @leeclowsbeard, agency principal Eric Gordon contacted me about giving DA a sharper, smarter voice that was more in line with his own attitude as he sought to separate the firm from the similar-sounding wannabes that made up the competition. So I did. 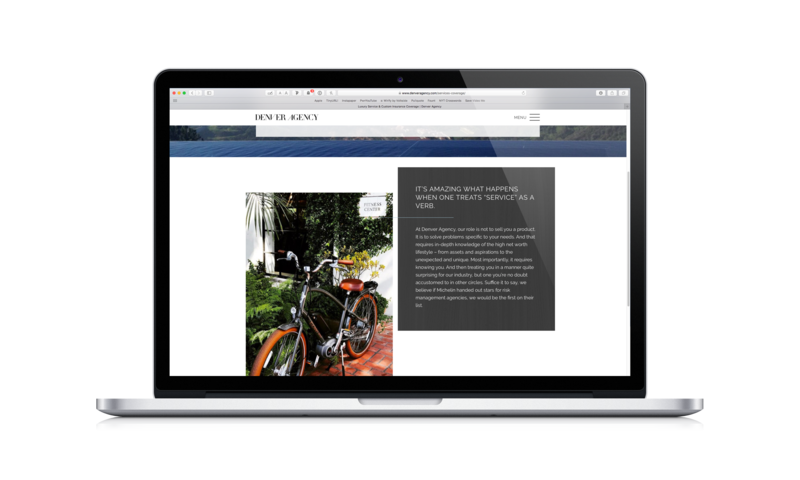 After the brand voice work was complete, the client undertook the development of a new website with a local agency. Unhappy with their ability to capture the finer nuances of the brand’s new tone, Eric brought me in at the eleventh hour to completely rewrite the site’s content, which you can find here. 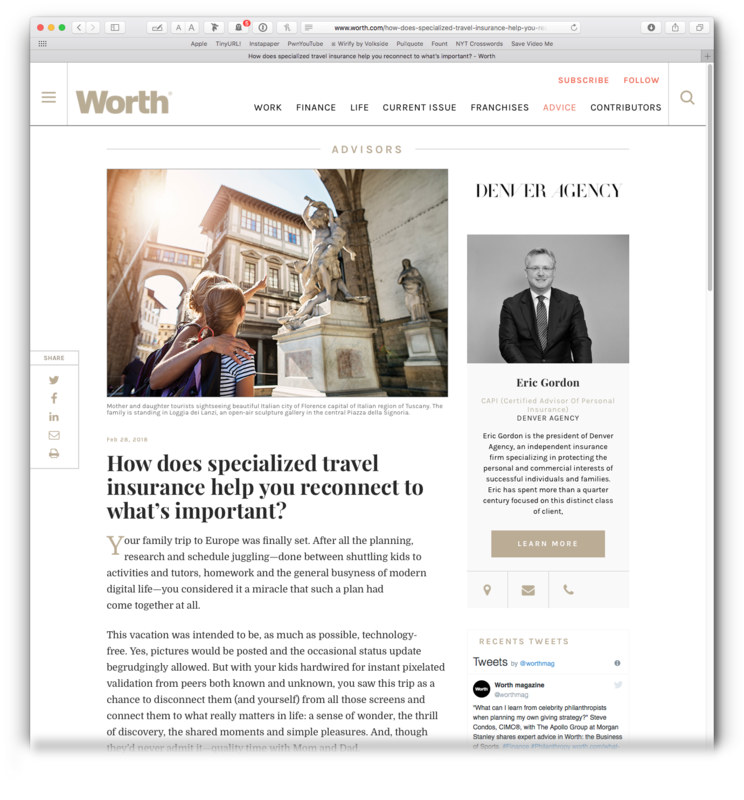 In late 2017, Worth Magazine invited Eric to write a quarterly column discussing the issues facing high net worth individuals and the insurance professionals charged with protecting their interests. In turn, Eric invited me to lend him a hand. With a pen in it. Okay, a keyboard, but that’s so much less poetic. Below is the copy and a screenshot from the 2018 Q1 column, which you can also find online here. Your family trip to Europe was finally set. After all the planning, research and schedule juggling—done between shuttling kids to activities and tutors, homework and the general busyness of modern digital life—you considered it a miracle that such a plan had come together at all. This vacation was intended to be, as much as possible, technology-free. Yes, pictures would be posted and the occasional status update begrudgingly allowed. But with your kids hardwired for instant pixelated validation from peers both known and unknown, you saw this trip as a chance to disconnect them (and yourself) from all those screens and connect them to what really matters in life: a sense of wonder, the thrill of discovery, the shared moments and simple pleasures. And, though they’d never admit it—quality time with Mom and Dad. Unfortunately, life, nature and circumstance often conspire to ruin the most well-intentioned plans. And when Iceland’s most active volcano, Grímsvötn, decided to spew ash literally into the stratosphere, your flight to Italy went up in smoke as well. Unfortunately, it took with it every nonrefundable deposit, booking, activity and reservation you had made. The loss of family time was disheartening enough, but the hefty financial toll you incurred wasn’t going to be easy to absorb either. While the above scenario—volcanic eruption excepted—isn’t exactly rare these days, its disappointing ending is much more common than it should be, given the existence of specialized travel insurance. Specialized travel insurance exists in a world beyond travel-booking websites and offers coverage that far exceeds the cursory indemnification offered by today’s credit cards—even high-end cards made of actual onyx and anodized platinum. The difference is substantial, akin to the difference between winging it by opting for a conventional, limited policy and engaging an expert to craft something specific and robust. Honestly, anytime you travel and risk a potential material loss, you should obtain specialized coverage. It’s true that many potential exposures exist in areas that “common” travel insurance addresses, but specialized coverage offers much broader protection and is tailored to the specific needs of the traveler. For example, a standard policy might offer only $25,000 of medical repatriation coverage while a specialized policy could provide $250,000 for the same exposure. If the latter amount seems extreme, consider: How many standard-issue policies would cover an airlift from the heart of Africa to London for emergency surgery, as was required for one of our clients? That’s the power and peace of mind a specialized policy offers. Of course, the more specific, unconventional and costly the travel plans are, the less likely a standard policy or carrier will provide adequate coverage (if any coverage is offered at all). Take, for instance, a wedding in Florence, Italy. General trip and event-cancellation coverage may not be difficult to obtain. However, when those coverage requirements include the costs of flying in 100 guests and housing them in a fully rented-out luxury hotel, the generous host would be remiss not to insure himself against being on the hook for over $2 million if plans go awry. Typical? Hardly. True story? Indeed. When the time comes to acquire such a policy, then, you’d be wise to select an agent who is as specialized as the coverage being sought. Someone who understands and appreciates your lifestyle and has the relationships and resources to construct best-in-class coverage for a worse-than-you-imagined scenario. Your agent, like you, should want travel to be not a misadventure fraught with risk but an adventure filled with family, friends and memories made to last a lifetime. And if you’re really lucky, that adventure will include the realization that Mom and Dad are pretty decent travel companions after all.